In March this year, when Snapdeal started offering luxury yachts through their online marketplace, we had assumed that India has reached the pinnacle of online luxury market. But we were wrong then. 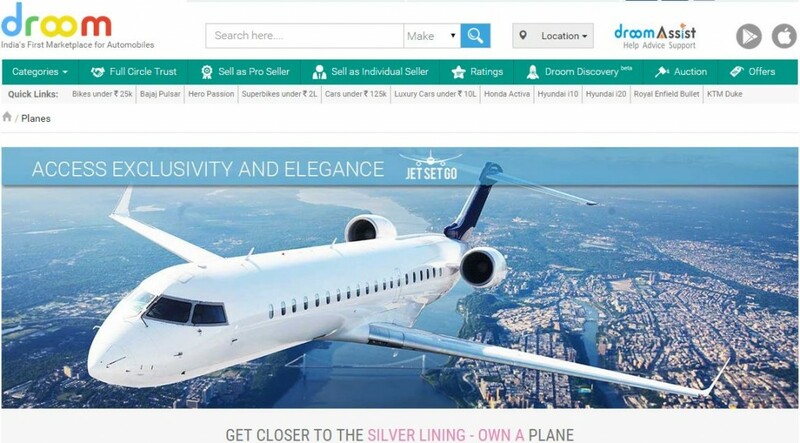 Droom, which claims to be India’s largest market place for second hand automobiles with more than 6000 listings from 10,000 buyers and sellers, have opened up another extreme luxury segment: Private Jets and Helicopters. Users can now buy or rent a private jet or a helicopter using Droom’s online marketplace. This marks Droom’s debut into the aerial vehicle segment as well. This arrangement has been done in partnership with JetSetGo, which is India’s largest marketplace for private jets. As per the current listings available on Droom, the luxury of a private jet or the excitement of a helicopter ride can make a big hole in the pocket; but considering that they are targeting a luxury segment, the prices seems justified to some extent. For instance, a special birthday party on helicopter in Bangalore will cost Rs 1,48,200, which includes 60 minutes of ride with birthday cake and beverages for 6 adults. A bachelor party on a private jet in Pune will be charged Rs 2,96, 400, during which 8 adults can have a gala time up at 36,000 feet for 2 hours. It includes a meal and hard drinks as well. Similarly, a birthday party on a private jet in Mumbai is listed for Rs 1,71,000 which includes 60 minutes ride along with birthday cake, balloons and meals for 8 adults. As of now, these exclusive luxury trips are being offered at Pune, New Delhi, Mumbai, Ahmedabad and Bangalore locations. Last month, Uber and Droom had partnered to offer Delhites a ride in super cars, which included Ferrari, Hummer and Lamborghini. Droom has just received a fresh infusion of Rs 100 crore as venture funding from LightBox, and in the next 18-24 months, they expect to add 20 more categories in the automobile sector, along with massive expansion plans to include 50,000 sellers and more than 2,00,000 listings on their platform. It would be interesting to observe how many customers from India can afford such expensive rides in Private Jets and Helicopters to celebrate special occasions; but yes, Indian eCommerce industry has certainly jumped few levels in this bargain. "Now, Rent or Buy A Private Jet and Helicopter Online With Droom; Fares Start From Rs 1,48,200", 5 out of 5 based on 3 ratings. Snapdeal Ties Up With Banks & Wallets For Discounts Worth Rs 100 Crores! 80% Of Snapdeal Employees Will Be Terminated Soon; The Road Ahead is Tough! Amazon Bringing Temporary Physical Outlets To Support Their Biggest Fashion Sale!